Hard work and courage celebrated in abundance at The Guide Dogs Annual Awards ceremony in London last week. 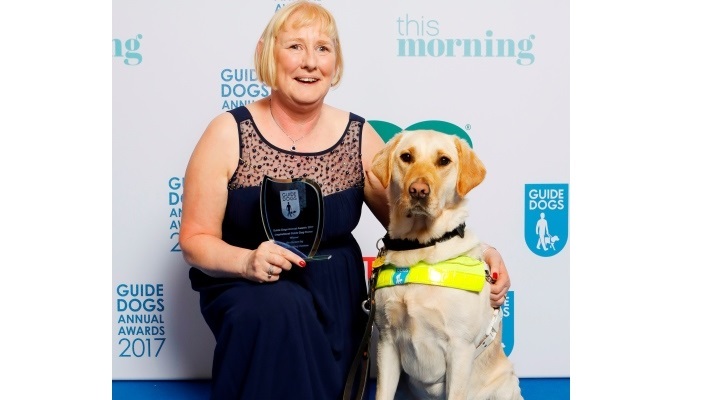 All eyes were on the prize as the first award presented at the Guide Dogs Annual Awards 2017 was chosen by viewers of ITV This Morning. Presenters Holly Willoughby and Phillip Schofield appeared on stage via a large screen as they opened a golden envelope in front of a celebrity audience to reveal that Louise Jenkins was the winner of the prestigious Inspirational Guide Dog Owner Award. The award-winning live magazine show featured films of the three finalists, in the week prior to the awards ceremony, to recognise those who have made exceptional achievements or who have overcome significant challenges in the last year. Getting a guide dog was as life changing for Louise as her sight loss. She quickly returned to her independent and confident self. She retrained at university and now manages a drop-in centre for people with mental health needs. As well as working full-time she also provides home care for her husband and looks after her parents who also have complex health needs, travelling the 160-mile journey to their home by train. Guide Dogs has worked closely with This Morning over the last couple of years as the show’s viewers have followed puppies Clover and Luna on their journey to become working guide dogs. Won by Dianne Woodford and guide dog Darcy. Presented by Dame Mary Perkins, co-founder of Specsavers, to Kimberley Burrows and guide dog Tami. Won by Karl Lloyd, Liverpool City Council.